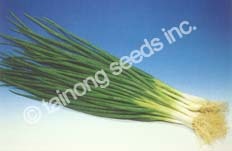 Bunching Onion 蔥 | Tainong Seeds Inc.
Other names that may be applied to this plant include green onion, spring onion, scallion, escallion, and salad onion. These names are ambiguous, as they may also be used to refer to any young green onion stalk, whether grown from Welsh onions, common onions, or other similar members of the genus Allium. Excellent variety; popular for its quality and taste. Good for summer harvest for high heat tolerance. Deep green leaves, long stem. High tolerance to Downy mildew and Alternaria leaf blot.